Roasted red peppers are, in my opinion, one of life's little luxuries. They're so mildly sweet with a smokey flavor that can compliment almost anything from salads to pizza. I had some peppers that were starting to shrivel up so I thought I'd roast them before they went bad. Roasting peppers is so easy that you should definitely give it a try if you love the taste of roasted peppers but hate paying for them at the grocery store. You can also flavor them many different ways to come up with a unique combination of flavors to fit whatever suits your palate. There are a couple different ways peppers can be roasted but I prefer to just use my stove's burner for consistency and control. It's also very easy and doesn't leave a mess. 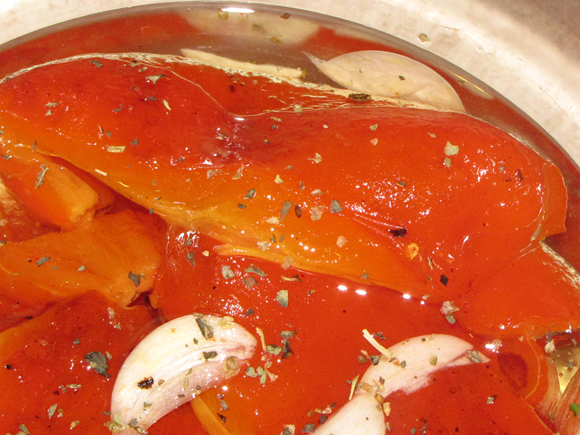 If you'd rather go the oven route, preheat your oven to 450° and place your peppers on a foil-lined baking sheet. Roast them for about 40-45 minutes until they are charred. Turn them over halfway through the cooking time. When done, place them in a bowl and continue with Step 5 below. 1. Wash peppers and remove any stickers. Dry thoroughly. 2. Place one pepper directly in the middle of the burner. 3. Turn the heat to medium-low and char the pepper until the skin is black. Don't worry if you hear popping or sizzling, this is just water from the pepper coming out. 4. Rotate the pepper, as necessary, to make sure all the surfaces have been covered. 5. When all the sides are black, remove the pepper and place in a glass bowl. Cover with plastic wrap or a plate to trap the steam. This will make the skin very easy to remove. Allow the peppers to cool. 6. Once peppers are cool enough to handle, take off the skin. You can do this by either peeling it off or rubbing it away with a cloth or towel. Do not rinse the peppers because you will lose the smokiness from the flames. *Optional - Once the skin is removed, put the pepper in a strainer over a bowl. Cut a slit towards the bottom to drain the juices into the bowl. This juice can be used later on. 7. Carefully cut around the top stem, being gentle around the seed area. You should be able to cut in a circle around the stem to keep most of the seeds attached. Remove any stray seeds. 8. You can leave the peppers as large pieces or cut into slices at this point. 9. Place peppers in a jar or container and add just enough oil to completely cover them. Add the reserved juices if you saved them. They will store in the fridge for about 1 - 2 weeks. These additions to the peppers are really good but you can add so many different things to the oil to make them your own. There could be a sweet version with a little sugar, you could try to add some chili pepper flakes for kick, or even vinegar for more of a pickling effect.